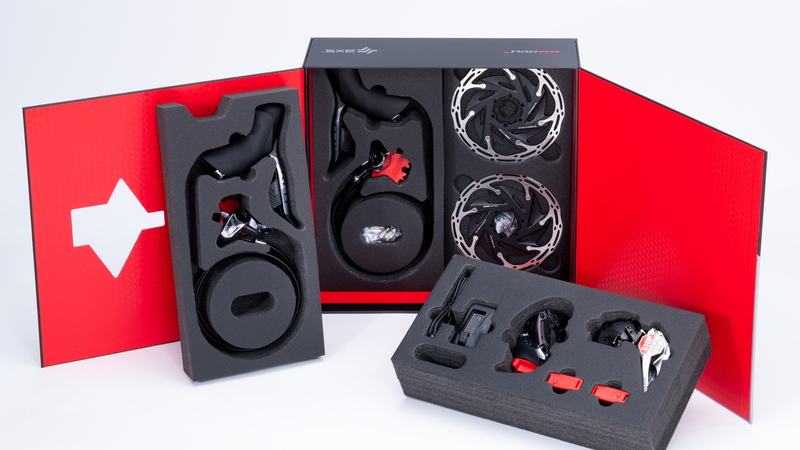 Sram has unveiled two new platforms in their arsenal – RED AXS and Eagle AXS – both fully-integrated, wireless, and incredibly simple to use. 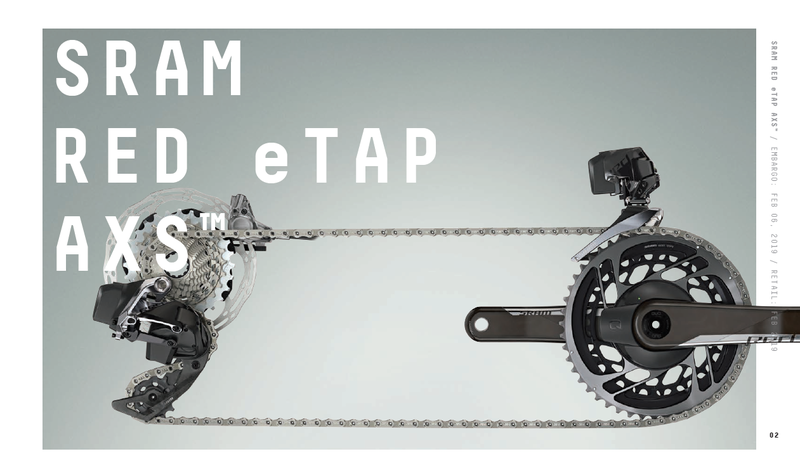 SRAM RED AXS is a road group based on SRAM’s successful E-tap system. Notable upgrades over current e-tap include a larger drivetrain range thanks to the use of an XD hub driver to allow for cassette cogs as small as 10-tooth, a new stronger, quieter chain, and increased personalization from the AXS™ app. On tarmac or gravel, 1x or 2x, eTap AXS™ gives a quiet, secure, and smooth ride. Orbit™ chain management and a unique Flattop™ chain allows for more confidence and efficiency over virtually any terrain. The SRAM AXS™ app allows riders to see battery status, change component behavior, personalize controls, get maintenance reminders, and update firmware. A smaller eTap BlipBox™ easily integrates into aero frames or the new Zipp Vuka Aero bar, improving aerodynamics and allowing for a super sleek look. A Quarq DZero™ power meter is integrated into AXS chainrings, making power measurement more affordable, accessible, and lighter. 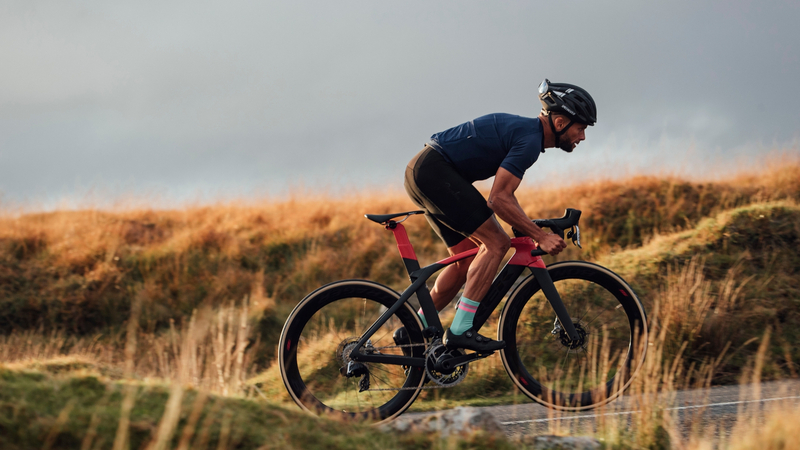 AXS™ allows you to mix and match Road and MTB components, allowing for cool features like dropper post control through a drop bar groupset, ideal for modern gravel and adventure bikes. it silent and secure no matter the terrain. The derailleur also comes with larger X-SYNC™ pulleys and ceramic bearings for increased durability and efficiency, and faster motors and signals, for faster shifting. Specifically designed for wireless electronic shifting, the SRAM RED® XG-1290 cassette progresses fluidly and quickly through a wider range of gears than previous RED offerings. and the one-piece design offers you the best in weight savings. More gradual gear progression between cogs—at least five one-tooth jumps – makes for smoother shifting, while a 10-tooth first cog helps provide a wider gearing range, thanks to the new XDR™ driver body. While shifting is fully wireless, braking is still fully hydraulic. 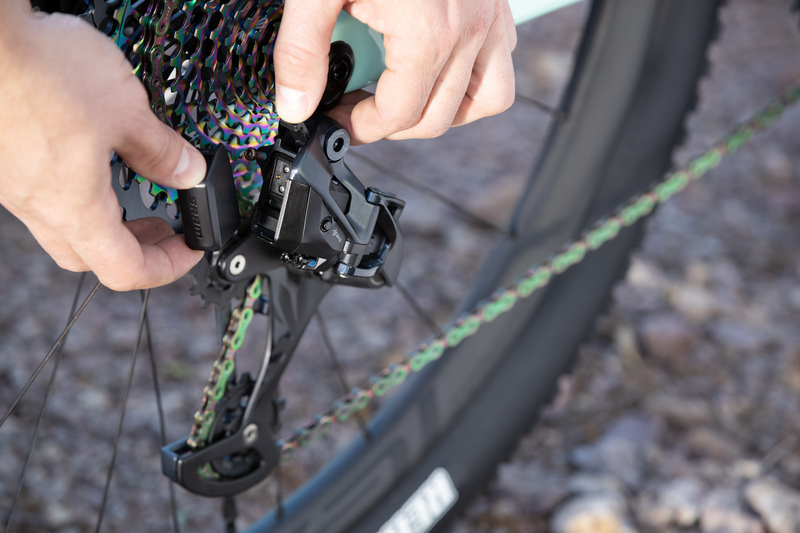 The SRAM RED eTap AXS™ HRD shift-brake system is AXS™ enabled and easily personalized for hand size and reach, and the new brakes share SRAM MTB’s Bleeding Edge™ technology for easy and clean brake bleeds. Brake calipers are available in flat mount and post mount caliper options. Significantly smaller, the SRAM eTap AXS™ BlipBox is now easier to integrate—mounting inside a stem faceplate cap, feed box or frame. It’s also AXS™ enabled, for easy personalization. The SRAM RED AXS™ cranks feature reduced chainring size, thanks to increased range from the cassette, and a 13-tooth delta on all chainring pairs, ensuring precise shifting for any setup. This results in more useful gearing and better shifting across all configurations. Power Meter enabled SRAM RED AXS™ cranks are designed with Quarq DZero™ power measurement in the crankset, capable of measuring left and right legs separately. Power readings are accurate within +/-1.5% and aren’t affected by climate conditions during a ride. SRAM Eagle™ AXS represents SRAM’s first foray into electronic (and wireless) shifting for MTB. SRAM Eagle™ AXS offers unprecedented personalization and control of the drivetrain and enhances capability while removing complexity. Both XX1 Eagle AXS™ and X01 Eagle AXS™ are based on previous 12-speed Eagle™ technology with the addition of a wireless electronic derailleur and controller. A completely new shifter and all-new derailleur (specifically designed and optimized to be motor-driven instead of cable-actuated), enables customization and scale to an individual rider’s liking via the AXS™ app. 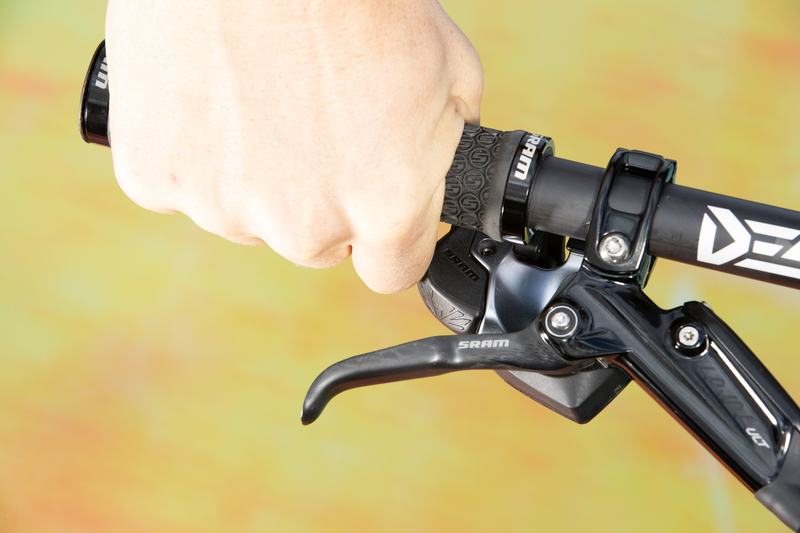 Eagle AXS™ allows riders to shift under load, over the roughest terrain, uphill, or without changing their grip on the bar, thanks to their secret upshift button located by the riders index finger. 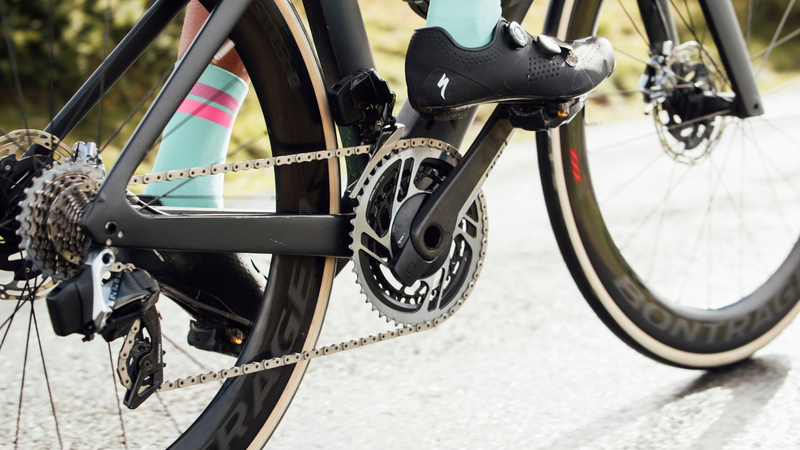 SRAM XX1 Eagle AXS™ features a carbon cage and ti hardware to ensure the lightest and stiffest derailleur possible, and utilizes SRAM’s new X-SYNC™2 chainring. SRAM X01 Eagle AXS™ has the same 500-percent gear range of mechanical Eagle, but with a more secure and longer wearing X-SYNC™2 chainring. The resilience of an aluminum cage, paired with the connected components of Eagle AXS™ensures that it will shift predictably and precisely, even under heavy load in rough terrain. More than a mechanical derailleur with a battery and a motor bolted on, the Eagle AXS™ derailleur is the brain of the whole AXS™ system. From the box, all it requires is limit adjustment and pairing before it is 100% ready to ride. It features a shorter cage for 10mm more ground clearance, with more chain wrap on the cassette to sit slightly further forward, and further inboard from mechanical Eagle™. The elimination of cable, housing and wires allows SRAM engineers to design a completely new shifting experience with ergonomic touchpoints that operate from a light press. 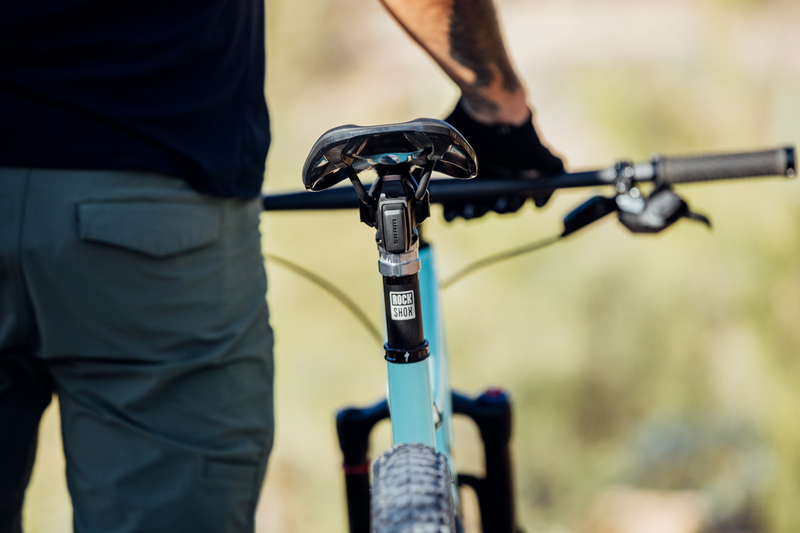 When paired with the (optional) AXS™ app, riders can reassign button functions to create their ideal shifting (and dropper-post actuation) system. The AXS™ Secret Sprint Paddle, oriented on the front-side of the controller near the rider’s index knuckle, allows for quick shifts with virtually no change to hand position, ideal for use in sprints. Bolt it on, set three limit screws, press the pairing buttons, and go. Eagle AXS™ is trimmed and adjusted electronically for a perfect chainline, meaning that there is no additional effort to shift or idiosyncrasies to learn. The Eagle AXS™ uses a removable battery for easy recharging after 20 hours of ride time. The battery weighs 25g and is detachable with a single clip. The battery is compatible with the Reverb AXS™ seatpost and SRAM RED or Force eTap AXS™ road group, and it only takes an hour to charge. Battery life can be checked on the app, or by pressing the button on the derailleur, where an indicator light provides charge level information. To prolong battery life, the system goes to power save mode when the bike is stationery. The Eagle AXS™ system is completely water and dust proof to the IP69K international standard. Initially developed for construction vehicles and food sanitization, the IP69K standard validates systems that require regular pressurized cleaning. The AXS™ app makes it possible to both program and personalize Eagle AXS™ to rider specifications, allowing for adjustments and personalized controller assignments for shift and Reverb™ commands from a mobile device. The app is not necessary for AXS to function; it is only needed for further personalization or to gain access to the data the system has accumulated. SRAM AXS™ Road and Mountain groups will be available soon through your local Live to Play Sports dealer! Preorder yours today!